Happy Birthday Smithsonian! Celebrating 100 years with more than just a toast of cake and champagne, the museum celebrates with the gift of a rare, blue diamond. The coveted famous Cullinan Diamond was gifted to the Smithsonian from the gracious owner. The blue 2.6 carat oval diamond is suspended from a delicate diamond ribbon bow center motif set on a chain of diamonds in blackened platinum—typical of the fashion rage of the Edwardian style in 1910. Thomas Cullinan, a South African explorer, discovered the largest diamond ever found, an incredible 3,106.75 carats! As custom dictated for the time, Mr. Cullinan presented the rough diamond to King Edward VII for his birthday. The diamond was cut into nine blue diamonds that were set into various jeweled objects for the crown jewels belonging to the royal family. 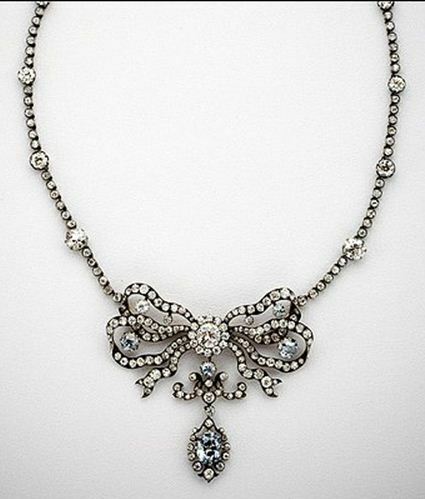 Mr. Cullinan, commissioned the bow necklace to be made for his wife with one of the beautiful blue diamonds. The necklace was bequeathed to the first daughter of each new generation of the Cullinan family. The great granddaughter sold the necklace in the 1980’s to an antique jewelry dealer who then sold it to a private collector. The private collector donated it to the Smithsonian for the centennial celebration. Each year millions of people flock to the National Museum of Natural History to see the Hope Diamond—and nearby now sits the Cullinan. Two rare blue diamonds with different histories and lore.